Want to get Alana‘s best weight-loss and fitness tips delivered to your e-mail account once a month? Heart Smart, Alana‘s free newsletter, is chock full of motivational tips, fitness advice, recipes and meal ideas, and much more! Check the sample newsletters below and then sign up (on the bottom of this page) to get Heart Smart every month! Twitter Followers sent in their favorite, quick and easy meals that are perfect for a weeknight dinner. 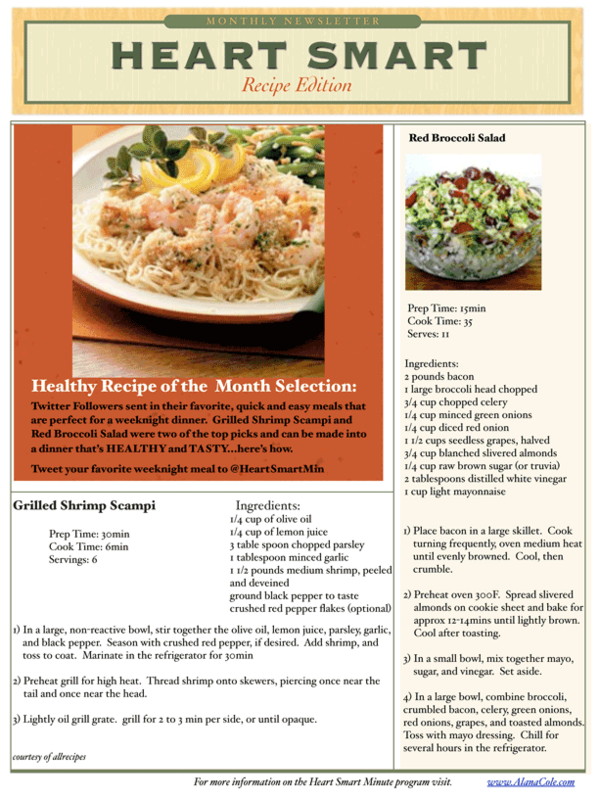 Grilled Shrimp Scampi and Red Broccoli Salad were two of the top picks and can be made into a dinner that’s HEALTHY and TASTY… here’s how. October Newsletter – Nutrition is the Best Medicine! November Newsletter – Thinner Thanksgiving Tips! December Newsletter – 4 Daily Habits! January Newsletter – 2013 Strongest & Healthiest! February Newsletter – Heart Smart Foods!